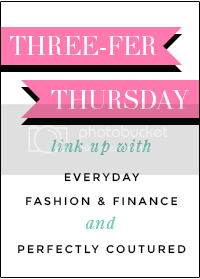 If there is one thing you know about Everyday Fashion & Finance, you know we love a good look for less! This Target Merona Mini Satchel is pretty spot on compared to the Kate Spade Grove Court Maise. At only $33, you're saving $315 (or approximately 91%) while achieving the same exact look. Now, of course, we cannot argue against the quality of a Kate Spade handbag vs. a Target handbag, and I am a firm believer in splurging on a nice, classic bag. However, I wouldn't splurge on this one. I have many Target bags, and I have found the Merona brand to be of decent quality. For something that is not real leather, the material is usually pretty soft and well-constructed. So, if you're like me, and don't want to spend the extra $300, the Target Merona Mini Satchel is an excellent option! Happy Thursday, darlings! We are so thrilled that the "official" start of spring is only a week away! Finally! As always, thank you to those who linked up last week! We love getting inspiration from your posts and are looking forward to seeing what you have in store for us this week. So get linked up, meet some new blog buddies and check out these fabulous ladies while you're at it! 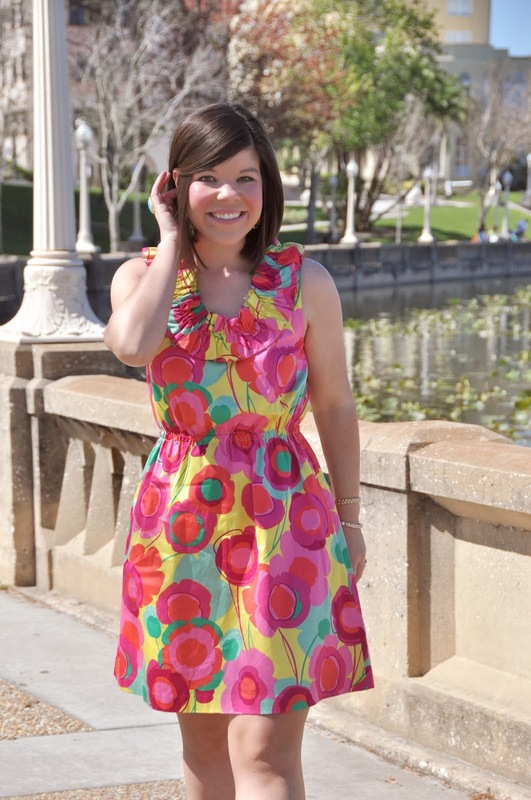 Gentry of Girls Meets Bow looks darling in her bright, springy dress. We love the bold print and the ruffled neckline on this little number. She seriously has us wishing for warmer temps so we can start wearing dresses too! 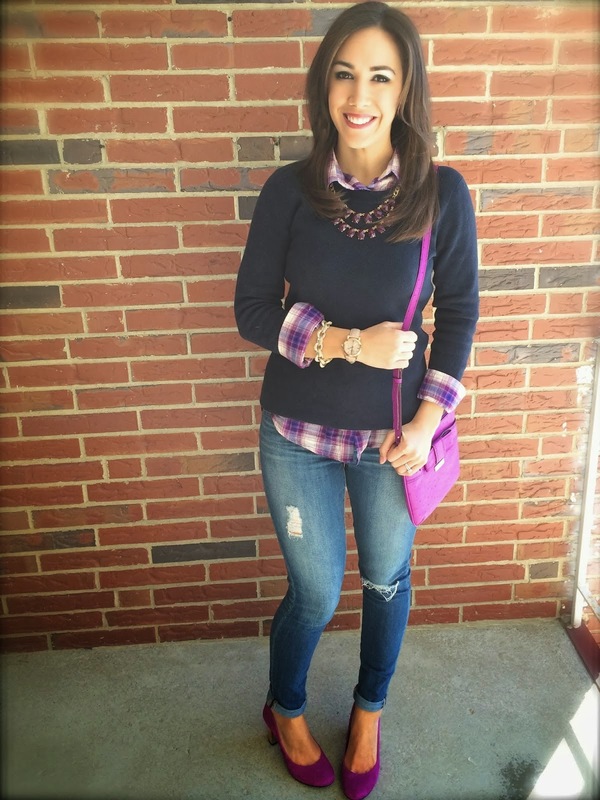 Sara of Style for the Seasons looks chic in her windowpane top paired with a leather skirt. And of course we are loving the pop of color she added with her beaded rose necklace! This look is a perfect example of how to transition darker colors into spring. Annick of Bold Subtletly created a new look by layering lace over one her dresses. We love how the lace brightens up the look and gives it a feminine touch. And of course we are swooning over that bold colored cross-body bag! As we see more and more spring (and summer) fashion make its debut, I cannot help but notice that the nautical trend is back in full force. I am not at all surprised. The nautical trend is classic, preppy and chic. I am thrilled to see that it's still hot for 2014. As I was rounding up the items for this post, I remembered I did a nautical trend post almost exactly a year ago where I also shared my key rules for pulling off the trend. If you're curious or looking for tips, check it out - the rules still apply! In the meantime, below are a few of my nautical faves, 2014 edition. With all of these nautical items appearing in stores, it must mean spring and summer are coming soon, right? It's so hard not to scoop up every single item! However, I predict that we will see many more items make their appearance over the next few months as well. All of this nautical talk definitely has me dreaming about summer and boating, but instead a snow storm is coming (again). Kind of sounds like a broken record, doesn't it? I just keep reminding myself warmer weather is coming eventually…it has to, right? Are you excited for the return of the nautical trend? What items are on your wish list for spring and summer? Happy Friday! Although it may not feel like it, spring is upon us, and I could not be more excited. Temps are warming up here this weekend (to the 30's - woo hoo! ), and it's time to spring forward! Today, I've rounded up a few things that I've been loving lately. As usual, the theme is bright colors, patterns, gold and comfort. Hope everyone has a bright and sunny weekend! Jonathan Adler for TOMS. You may have already heard about it, but TOMS and Jonathan Adler have teamed up to bring us a cheery line of shoes and sunglasses for spring! Obviously, we know and love Jonathan Adler as a home decor brand, so it is very exciting to see the brand's trademark bold prints and patterns used to create some super cute shoes and sunglasses. Happy Thursday, lovelies! We are excited to see that pastels and spring transition looks are making their way into the link up which means spring must be just around the corner! As always, thank you to those who linked up last week! We love getting inspiration from your posts and are looking forward to seeing what you have in store for us this week. So get linked up, meet some new blog buddies and check out these fabulous ladies while you're at it! Elizabeth of Undeniably Me is absolutely stunning in this winter white look. We think her coat is to die for and of course we are fans of those sparkly gold heels too! Natalie of Style Stun makes transitioning for warmer weather look effortless. We love her simple, yet chic look! And who would've guessed that this is an Old Navy top? Sara of The House of Shoes looks so springy in pastel and blue hues. We love the subtle print mixing with the layered stripes and those wedges are absolutely perfect with this look! 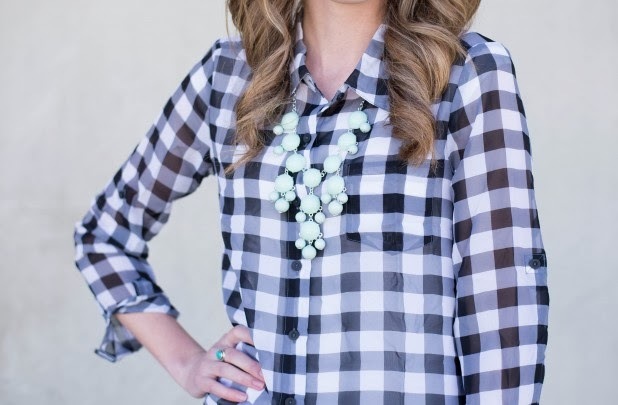 A classic gingham print shirt is a must-have, and at only $12.99, you can start collecting one in every color. These sheer options will be perfect for spring, but can also be layered now under a vest or sweater. My favorite is the navy, and conveniently, I don't have that color yet! Who doesn't love a fun phone case? Especially polka dots. 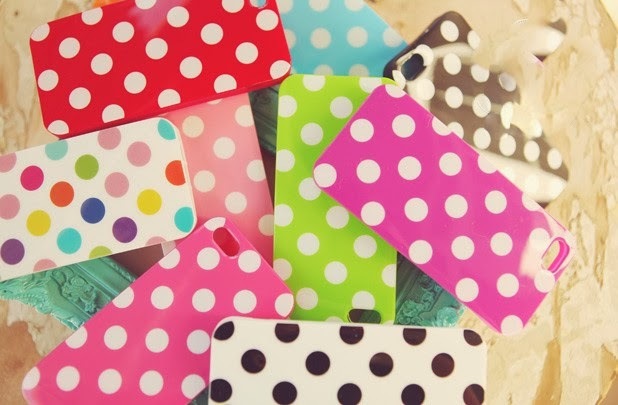 These cases remind me so much of my Kate Spade polka dot case. But, at only $2.99, you can afford to get a few! Even one to match every outfit, if you so choose! Happy Thursday! So many fun spring looks are making their way to the link up! We are definitely getting excited for spring to officially make its appearance. As always, thank you to those who linked up last week! We love getting inspiration from your posts and are looking forward to seeing what you have in store for us this week. So get linked up, meet some new blog buddies and check out these fabulous ladies while you're at it! 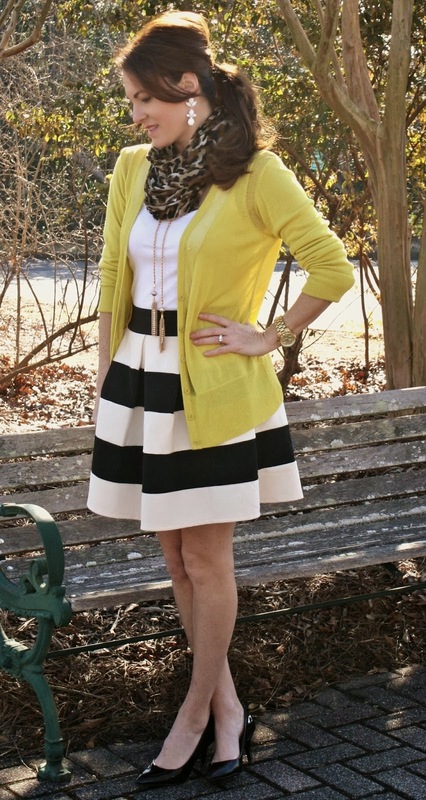 Blaire of Peaches in a Pod is transitioning into spring with a classic black and white skirt. We love how she paired it with a yellow cardi for a pop of color and a leopard scarf for some print mixing. Yuli of Sequins and Tulle nailed it with this floral skirt. It is absolutely perfect for spring, and we love how she paired it chambray - one of our favorite ways to style a floral print! 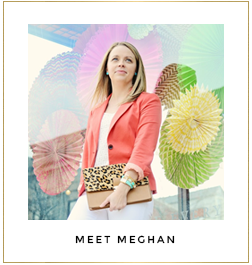 Danielle of For the Love of Leopard is rocking the 2014 Pantone color of the year - Radiant Orchid! Those shoes are to die for (don't miss the metallic gold heel), and you know we are a sucker for a cute Kate Spade bag.